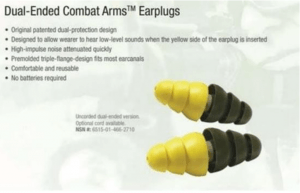 Current and former military members nationwide have suffered total hearing loss, tinnitus, or partial hearing loss as a result of defective Dual-Ended Combat ArmsTM Earplugs, Version 2 (CAEv2). These earplugs were standard issued equipment for soldiers deployed to Afghanistan and Iraq between 2003 and 2015 and were also used by military personnel worldwide. 3M’s Dual-Ended Combat ArmsTM Earplugs, Version 2 (CAEv2) were designed to provide soldiers with a single set of earplugs that offered two options for hearing depending upon how the earplugs were worn. When worn in the closed or blocked mode, the earplugs blocked sound in the same fashion as conventional earplugs. When worn in the open or unblocked position, the earplugs were supposed to block, or at least significantly reduce, loud impulse sounds of battlefield explosions, while still allowing the wearer to hear quieter noises such as commands spoken by fellow soldiers and approaching enemy combatants. The dual-ended ear plugs were too short to be properly inserted into users’ ears. As a result, the earplugs would gradually loosen without the user noticing. Given the imperceptibility of the defect, users would not have been able to detect whether the earplug had come loose. If you or a loved one were issued the defective Combat ArmsTM Earplugs while serving in the military between 2003 and 2015 and have suffered hearing damage, you may be entitled to compensation. Call the attorneys at 205.879.5000 Riley & Jackson, P.C. for a free consultation.